One of the members of my wine group is going on a retreat where he will be spending four months in total silence and will not be able to drink any wine. Before leaving, he wanted to try some older vintages of Ruffino that he had just purchased so we put together a group of six to have the wines with dinner at The Leopard at Café des Artistes. This group does not taste wine but drinks it with dinner or lunch. The wines we drank were made from 70% Sangiovese, 15% Canaiolo, 10% Malvasia and Trebbiano and 5% Colorino, Ciliegiolo and Cabernet. All of the wines included white grapes, Malvasia and Trebbiano, and all of them were made by using the governo method. The governo method, once common in Tuscany, is a secondary fermentation created by the addition of dried grapes 10-15%, or the must of dried or concentrated grapes. Colorino was usually the grape of choice to be dried. Ask almost any producer in Chianti today and they will tell you that wines made with white grapes and the governo method and aged in large Slavonia botti will not age! It is more difficult to make wine in this way. It is much easier to add 20% of an international grape variety and age the wine in barriques. But you will not have a better wine, you will have a “baby super Tuscan” and as we all know the only real super Tuscans were Michelangelo and Leonardo Di Vinci. As far as I know Querciavalli is the only Chianti Classico producer that still uses the governo method for their Chianti. 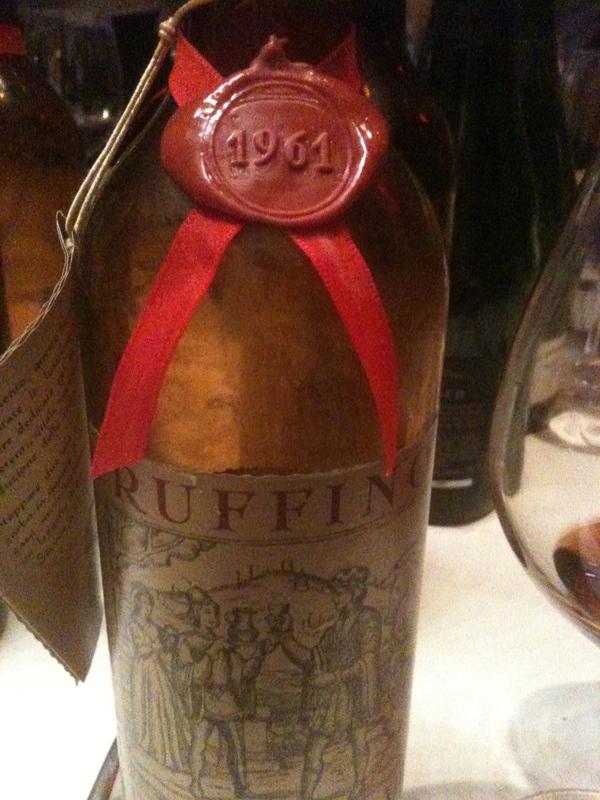 The best gapes from Ruffino’s vineyard were used for the Riserva Ducale, which spent at least three years in large oak casks. The Riserva Gold Label is a selection of the lots of the best vintages of the Riserva Ducale. The Riserva Ducale was first produced in 1927. The first release of the Riserva Ducale Ora was in 1947. They are the only wines that have the word Riserva as part of the wine’s name. When these wines were produced Ruffino was the largest producer of Chianti “Classico” (the 1958 just has Chianti on the label) and had the greatest holdings in the area –1200 hectares, 230 covered with vineyards. A few years ago a friend came over for dinner and brought with him a bottle of Riserva Ducale Ora. He wanted us to taste it and guess the vintage. Everyone there was involved with wine and had experience with older Chianti. 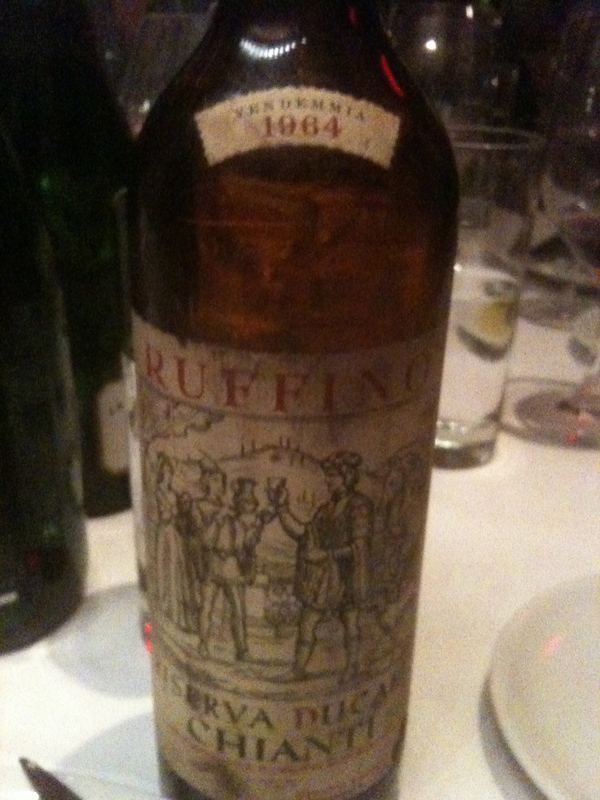 Someone guessed 1990, another 1982, another 1958 – not because it looked or tasted old but because 1958 was a great year. We were all wrong — the wine was the 1947. The wine was 57 years old at the time. Wasserman in his classic book “The Noble Red Wines of Italy” wrote of the 1947 Gold Label, which he tasted in 1983, “Brilliant, tawny robe with orange edge, lovely, almost Claretlike bouquet, persistent and expansive, toasty with a touch of blueberry, refined, a mouthful of wine, lots of class, a classic.” He gave it four stars, his highest rating. Recently I had the opportunity to drink with lunch the 1947 on two different occasions. The wine on both occasions was showing a bit more age than it did 8 years ago but did not taste like a wine that was 65 years old. It still tasted like a much longer wine. 1947 was a great vintage in Tuscany. It is interesting to note that none of the wines had the Gallo Nero, the symbol of the Chianti Classico Consortium on the neck label. 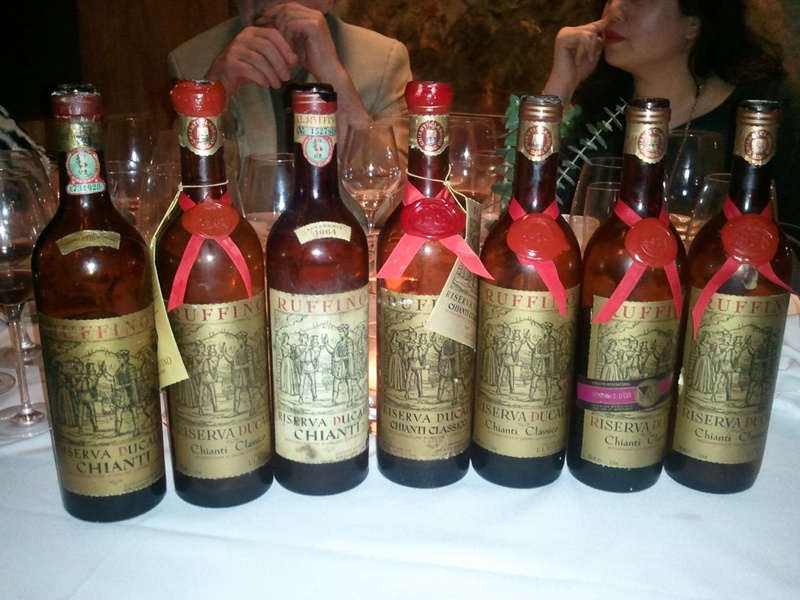 All of these wines and other older wines from Ruffino I have tasted have the “Putto on the neck label”, the symbol of the Chianti Consorzio, or they just had Chianti Classico on the neck label. I do have a bottle of Riserva Ducale Gold Label 1990 which has the Gallo Nero on the neck label. 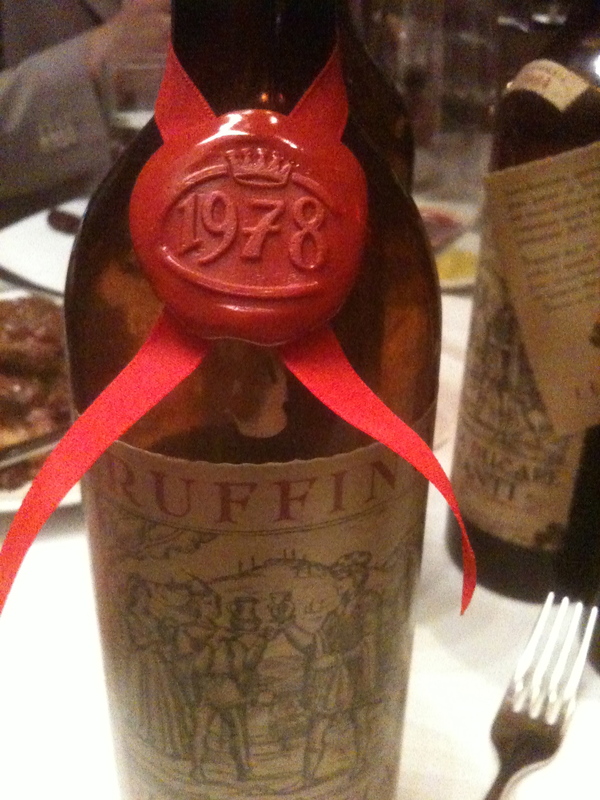 It seems that Ruffino did not join the Chianti Classico Consorzio until much later. Before my friend’s departure dinner, I looked at Wasserman’s book to see what he said about these wines as I respect his opinion and drank some of these same wines with him in the 1980’s. Riserva Ducale Gold Label 1958 This was an excellent vintage in Chianti and Wasserman rated it three stars. He also gave the wine three stars when he tasted it in 1983 and said “needs more time.” He was right as it was still drinking in 2012. Riserva Ducale Gold Label 1961 Wasserman said that the Consorzio gave two stars to the vintage but he did not rate the vintage having tasted only two wines. This wine was showing very well and was one of my favorites. Riserva Ducale Gold Label 1967 Wasserman calls it “…one of the best vintages of the 1960’s,” and gave it two stars. The Consorzio gave it four. In 1980 he tasted the wine and wrote, “Perfumed aroma; full bodied, still has tannin and considerable fruit, surprisingly young, needs more time, though it has a troublesome dryness at the end.” He rates it two stars with a question mark. Again he was right, the wine was drinking very well. Riserva Ducale Gold Label 1970 this was a very good vintage but suffered in comparison to the excellent 1971. Wasserman gave it two stars, as did the Consorzio. He wrote, “For the most part, the 1970’s are wines to drink not to hold.” Wasserman tasted the wine in 1981. “Color beginning to show age; floral bouquet with a raisiny notes; still has tannin to shed but the fruit is there to support it.” He gave the wine one/two plus stars. I do not think Wasserman believed these wines would last so long and enither did I. We tasted this wine together at my home and never imagined it would still be drinking so well today. Riserva Ducale Gold Label 1971 both Wasserman and the Consorzio give the vintage four stars the highest rating. All the wines were showing very well. I disagreed with Wasserman on the 1978 vintage. I have had a number of 1978 Chiantis over the years and have found them to be drinking quite well. In fact the 1978 Riserva Ducale Gold Label was the wine of the night for me. I am looking forward to my friends return from his retreat and we already have a dinner planned for October to drink the rest if the wines.